Critical Thinking Blog: All Opinions Are Not Equal: Bon Jovi ...Done Well? 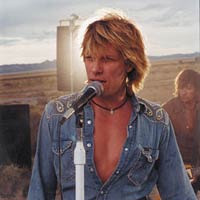 For those who have been participating on this project for a while, you are aware of my contention that most of the world's problems would be remedied through a mass burning of Bon Jovi albums. Anyway, last night, for the first time in my life, I enjoyed a performance of a Bon Jovi song. Only, it was not performed by the artist himself. On 'Bon Jovi' night (sigh) on American Idol, performer Blake Lewis gave an innovative performance of the song, "You Give Love a Bad Name". Check it out at the link above. This made me wonder whether it's the songs of Bon Jovi themselves that create the mass poverty and corruption in this world, or simply his wavy blond locks and boisterous claims of grandeur that create this threat.